American Horror Story new fourth Season is set to premiere on October 8, 2014. With a little more than a month left, FX has released a new poster (above) and some teasers, that you can watch HERE and HERE, the rest of them, you can watch on the FX Youtube channel. 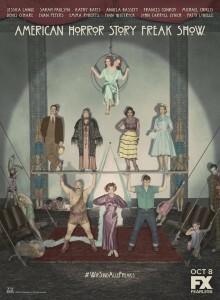 This new season will will be set in Florida in 1952, following one of the few remaining freak shows and its members, who are trying to do anything to keep the business alive. The Show’s executive producer Tim Minear has talked about it as the best season so far, at the San Diego Comic-Con. Jessica Lange is playing Elsa Mars. Peters’ character is the son of Chiklis’ character, while Bassett is playing Chklis’ wife and Bates is playing his ex-wife. As for the main monster of Freak Show, Minear revealed that it’s the show’s “scariest creation so far” and will be played by John Carroll Lynch.